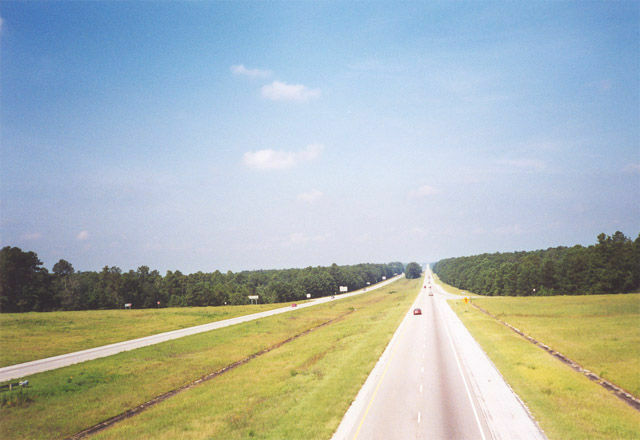 Interstate 65 travels the height of the state between Mobile and the Tennessee state line. The freeway serves the three largest cities and counties of Alabama along a 366.23 mile course. Signs posted periodically along Interstate 65 throughout the state of Alabama refer to it as the "Heroes' Highway". This designation was established in July 2002 in remembrance of Johnny Michael Spann, a CIA officer killed in the Afghanistan war and the victims of the September 11 terrorist attacks of 2001. Interstate 65 stays west of the built-up areas of Saraland and Satsuma through rural interchanges with Celeste Road and U.S. 43. This view looks north at the four-lane freeway from Mobile County Road 41. Photo taken 07/17/07. Dead Lake Road meanders east from U.S. 43 at Creola to Dead Lake under the Mobile River Delta bridges of Interstate 65. 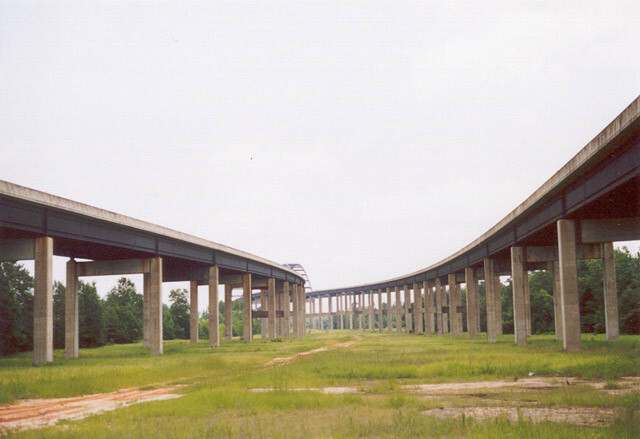 The only ground-level accessible view of the Interstate 65 Mobile River Delta bridges by car is available from this road. Photo taken 06/03. 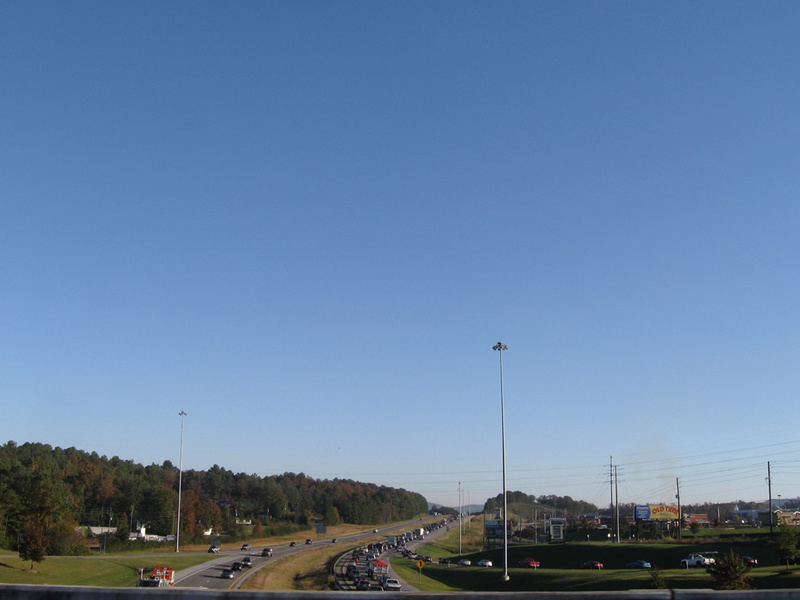 A westward view from the Alabama 225 overpass over Interstate 65. In the distance, the beginning of the Tensaw River bridge is visible. Pavement in southern Alabama, northwest Florida, and southern Mississippi is often bleached red. This is due to the native red clay that is used for the bases of roadways in the region. Photo taken 07/01. 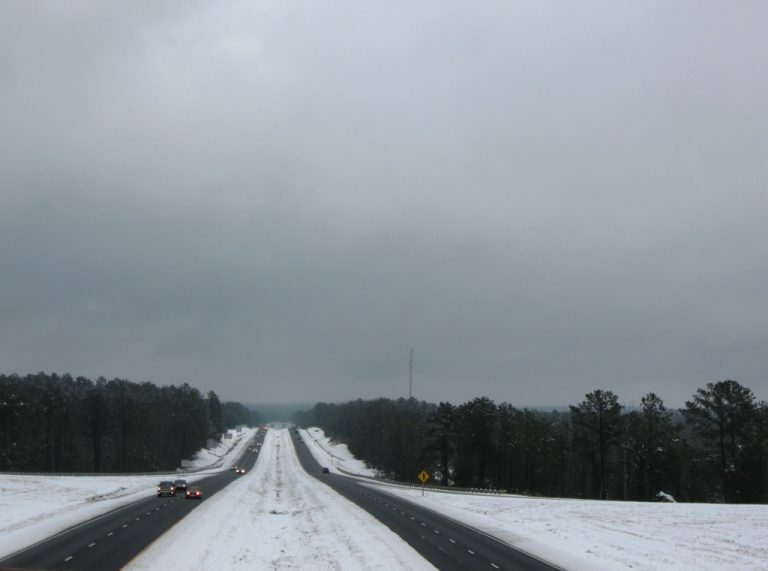 A rare Deep South Snow event blanketed up to four inches of snowfall across lower Alabama on this day, transitioning the normally green pine forested frontage of Interstate 65 into a scene more accustomed to northern reaches of the freeway. This view looks northeastward from the Alabama 41 overpass. Photo taken 02/12/10. 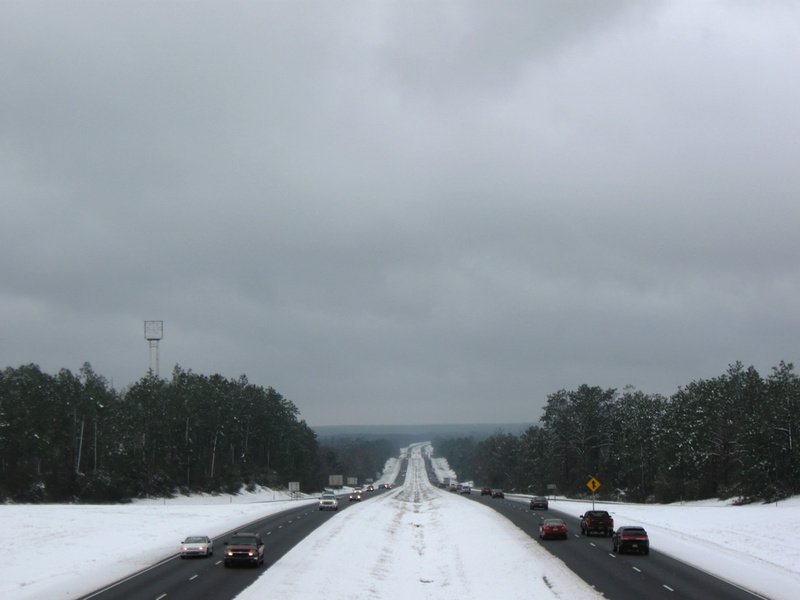 A snowy view of Interstate 65 leading southwest from the Alabama 41 overpass in rural Conecuh County. Snow is extremely rare in lower Alabama and on this afternoon, many area residents used hillsides within interchanges of the freeway with make shift sleds. Photo taken February 12, 2010. Sunset over the Interstate 65 crossing of the Alabama River from Riverfront Park in Downtown Montgomery. Photo taken 10/06/12. Morning traffic slows due to road construction north of the diamond interchange (Exit 238) with U.S. 31 near Alabaster. Photo taken 11/04/09. The $168.6-million project to complete the easternmost 2.5 miles of Interstate 22 included expansion of I-65 with collector distributor roadways north from Daniel Payne Drive (Exit 264) to U.S. 31 (Exit 265B). The interchange with I-22 opened to traffic on June 20, 2016. Photo taken 10/08/16. Northbound along the East I-65 Service Road at the on-ramp to Interstate 65 north of U.S. 98 (Moffett Road) in Mobile. Photo taken 11/21/08. Interstate 65 northbound shield posted along the I-65 Service Road north at Exit 22 in Creola. The service road parallels the freeway from Lister Dairy Road to the Jim Bell Branch. Photo taken 10/25/03. A companion shield directs traffic from the I-65 Service Road in Creola onto Interstate 65 north in Creola. The Sailor Road bridge over Interstate 65 opened in 1976. Interstate 65 otherwise ended here between 1970 and 1981. Photo taken 10/25/03. Escambia County Road 1 southbound at the Interstate 65 southbound on-ramp at Exit 54. CR 1 joins the freeway with the Poarch Creek Indian Reservation and Atmore. Photo taken 06/01/02. Reassurance marker for County Road 6 posted after Interstate 65. The freeway through Conecuh County is very rural and only a handful of traveler services options are available. Photo taken 06/02/11. Lowndes County Road 6 stems east from County Road 26 near Tyson to meet Interstate 65 at Exit 158. A short distance ahead is the Montgomery County line and transition to CR 24 (Cloverfield Road). Photo taken 12/31/08. Conecuh County Road 6 crosses paths with Interstate 65 at a diamond interchange (Exit 83) near Sand Cut. Construction of the freeway within Conecuh County was completed by 1960. Photo taken 06/02/11. Prior to June 2016, Interstate 22 ended just shy of Interstate 65 near Coalburg in north Birmingham. The connection then between Corridor X and I-65 was achieved by taking Jefferson County Road 77 (Coalburg Road) south to Daniel Payne Drive east and Exit 264. Daniel Payne Drive changes names to 41st Avenue North at the Sayreton community. Pictured here is a traffic light with 20th Street North ahead of the southbound on-ramp to Downtown Birmingham. Photo taken 06/02/11. Widening of Interstate 65 through the 41st Avenue North interchange resulted in the replacement of the northbound loop ramp with a new ramp to the south. 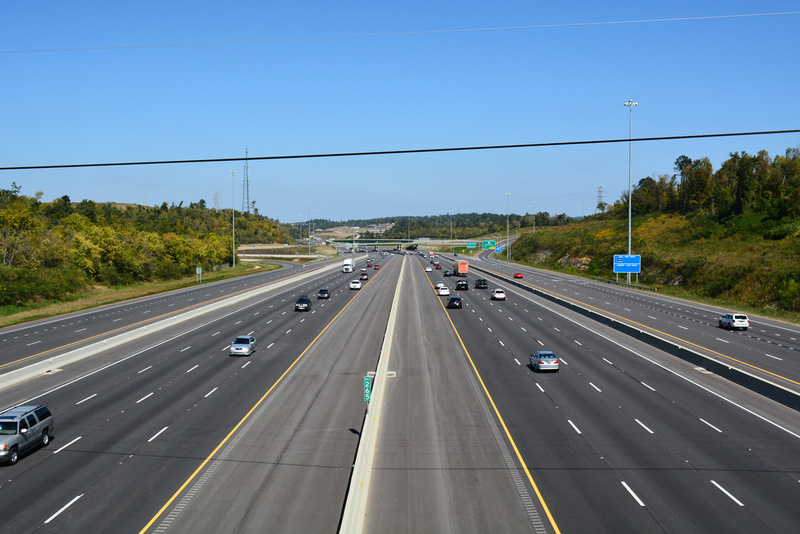 This work was completed in anticipation of Interstate 22 (Corridor X). Photo taken 06/02/11. County Road 5 pentagon posted west of Interstate 65 at Sulphur Springs. The rural highway leads southwest toward Red Hill, Empire and Summiton. Photo taken 12/28/09. Approaching the diamond interchange with Interstate 65 (Exit 289) along Blount County Road 5 northbound. Photo taken 12/28/09. Interstate 65 travels south 29 miles to Birmingham from County Road 5 at Sulphur Springs. 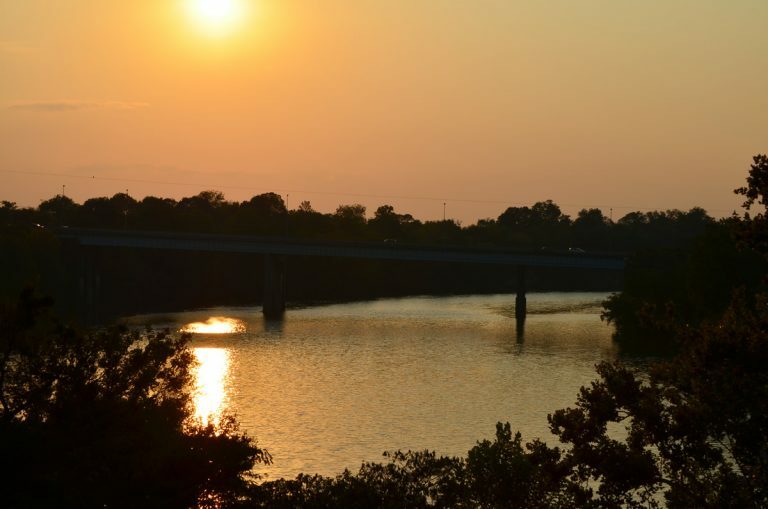 Huntsville is a 61-mile drive to the north via Interstates 65 and 565. Photo taken 12/28/09. This shield assembly directed motorists onto Interstate 65 from County Road 5 north at Exit 289. 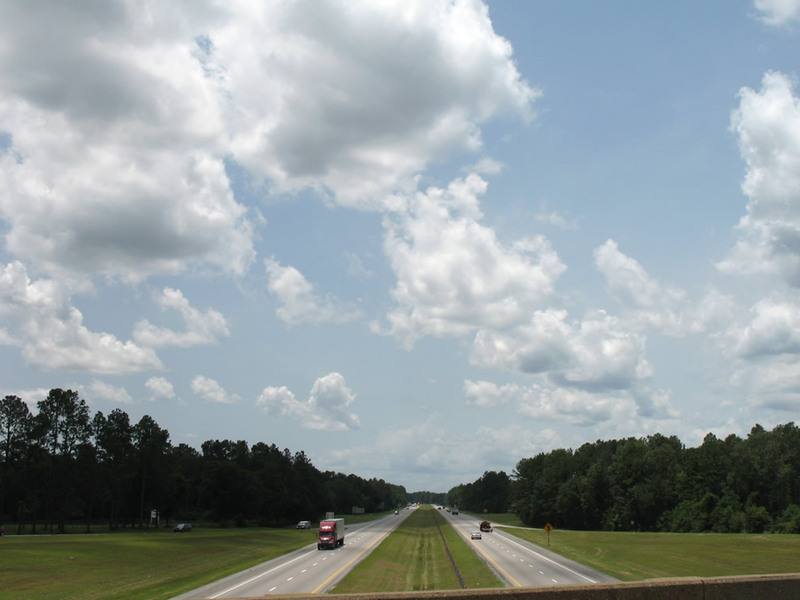 The first stretch of Interstate 65 in Alabama opened on December 10, 1959 between here and Warrior (Exit 282). Photo taken 12/28/09. Morgan County Road 55 (Pike Road) links the town of Falkville with Interstate 65 at Exit 322. Guide signage for the diamond interchange references Nashville, the original northbound control city of Interstate 65. References to Nashville were mostly greened out with Huntsville in the 1990s to coincide with the 1991-completion of Interstate 565. Photo taken 12/28/09. Motorists bound for Interstate 65 south to Birmingham depart County Road 55 east. Interstates 20 & 59 are a 61-mile drive to the south. Northward, I-65 meets Interstate 565 in 18 miles. Photo taken 12/28/09. "First Link Of State's New Interstate System To Be Opened." Times Daily (Florence, AL), December 3, 1959. "Another Section Of Interstate Highway Opened." Times Daily (Florence, AL), March 23, 1961. "Another Section Of Highway Opens." Times Daily (Florence, AL), March 31, 1961. "Patterson Helps Dedicate Road." The Tuscaloosa News, January 6, 1963. "61 Miles of Interstate Will Open During 1965." Times Daily (Florence, AL), May 11, 1965. "Interstate section opening up." The Tuscaloosa News, May 20, 1981. "James Dedicates Bridge; Links Montgomery, Mobile." Times Daily (Florence, AL), October 3, 1981. "Highway official says I-65 delays may have benefited Birmingham." Gadsden Times, December 19, 1985. "Widening of I-65 in north Shelby County to begin this week." The Birmingham News (AL), January 14, 2018.